Thank you seems like such a small word for the gratitude I feel. Your donations to Compassion In Action (I, jokingly, call the group the CIA!) mean a lot, to me for your support, and to the homeless people in Denver who will be warmer and feel a little more appreciated after today. The CIA group, men, women and children, met at my friend and the group's organizer, Kelly and Bill's house, at 9am. 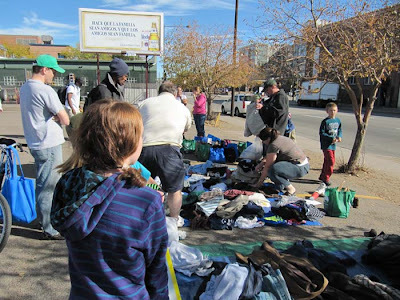 Everyone helped, right down to the smallest child, to sort the clothing, shoes and blankets. The children made cards and handed them out to the homeless people. Lunch bags were prepared, with sandwiches, water, juice and more. The lunches were each put into a sturdy bag or backpack, along with a hat, scarf, gloves, two pairs of socks, toothbrush, and bandaids. 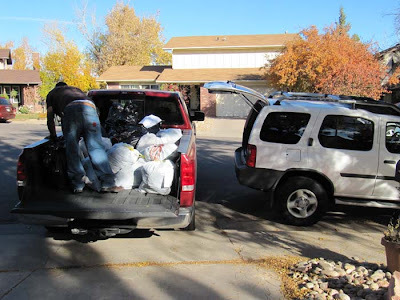 The clothing and blankets were sorted and put into large plastic bags: women's shirts, men's pants, shoes, blankets and so on. Everyone found a small spot to work as they sorted the donated bags of clothing. 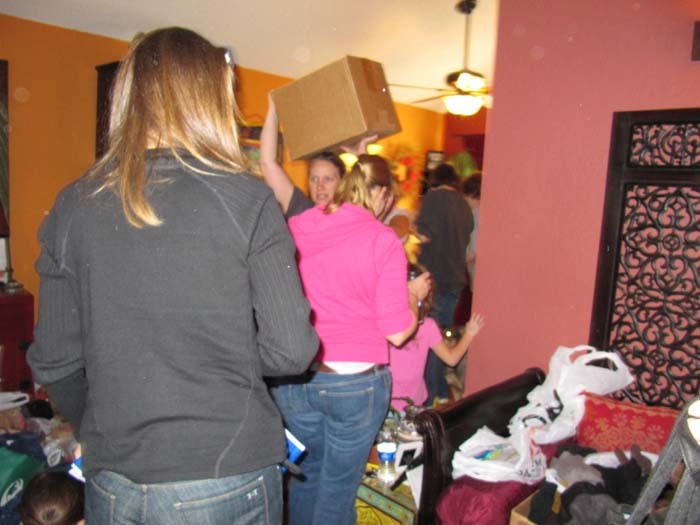 The whole house, including the garage, was packed with volunteers and all the items. There was a lot of activity, but it all very organized. That's our wonderful leader, Kelly, balancing the box on her head! Five vehicles were loaded up for the trip. All of us headed to parking lot which is across the road from the Denver Rescue Mission. Plastic tarps were laid out and the bags and clothing were spread out. 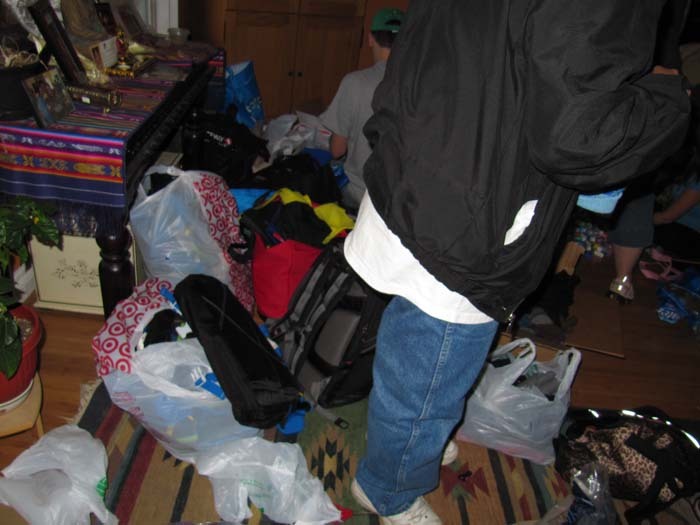 We were still unloading the bags when word spread about what we were doing. Men and women came along and chose what they needed and picked up lunches. They were so appreciative, we shared hugs, and I heard lots of "thank yous" and "bless yous". The arrow points to the Denver Rescue Mission. After about 3 hours, we were out of food and almost out of clothing. 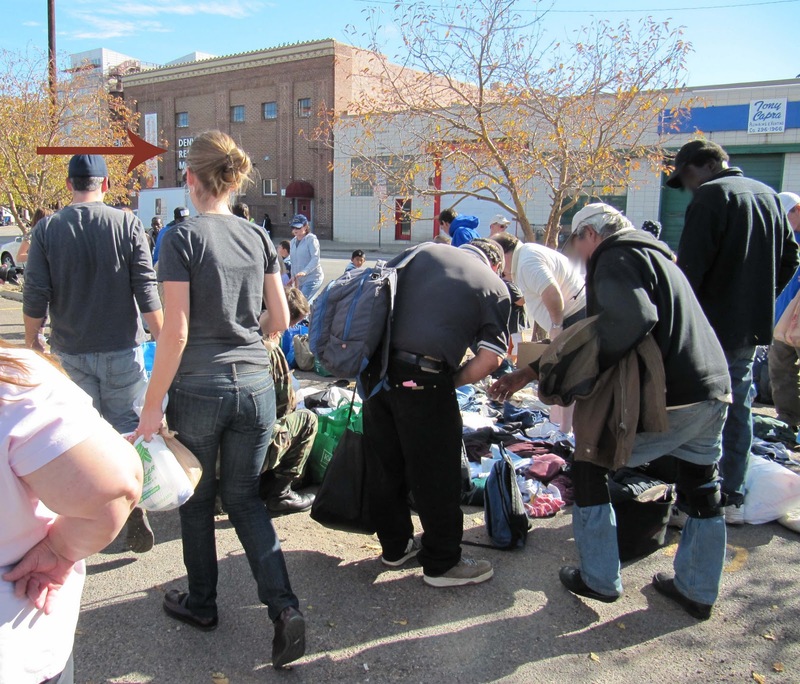 What was left was taken to the Denver Rescue Mission to be handed out by them. We were lucky enough to have one of the most beautiful days to do this, in the mid to high 70s and sunny. We couldn't have asked for a better day. This is a yearly event, with the donations being given out in November. If you'd like to donate anything for next year, please email me and let me know. If you live anywhere near south Denver, I'll be glad to pick up what you have. If you are farther away, we can find a more central place to meet. This year, A Knitted Peace yarn store was kind enough to collect things for me. However, since I no longer work or teach there, I really can't ask them to do it again. I'll be posting about it again next year in the fall. Again, thank you so very much. No one in the Compassion In Action group takes even a penny, and many spend their own money for food, backpacks, toiletries and more, so your donations are really appreciated. We couldn't do this without you.